Here at Fluid Controls, we understand that with all the different variations of check valves on the market, it can be overwhelming to decide which one is right for your application. That is why we have devised this blog to eliminate the stress of trawling the internet for answers and to help you choose the appropriate product once and for all. What is a fluid check valve? Our check valves are designed by Parker, who create products for the uni-directional flow of fluids in the oil and gas, and chemical processing industries. Each check valve has a unique selling point that sets it apart from Parker’s other products, which is why we will be exploring the merits of each. Diaphragm valves and check valves are very similar, but work in slightly different ways. Diaphragm valves contain a diaphragm and a seat, and are most commonly used in high-purity applications within the food and beverage, industrial and pharmaceutical industries. Part of the Parker Veriflo Division range, the F9 high purity check valve contains an asymmetric spring to ensure a discreet and almost noiseless experience. Its minimal envelope reduces the amount of panel space required and it contains not one, but two different sealing options for gas fitting requirements. With its stainless steel finish, the F9 high purity check valve is also highly corrosion resistant. CO Series Parker fluid check valves contain a high level of leak resistance and are favoured in the pulp and paper, power and utilities sectors. With competitive re-sealing capabilities, it is no surprise that this range of check valves has proven to be so popular – especially the F Series Inline Check Valve, with its heat code traceability. 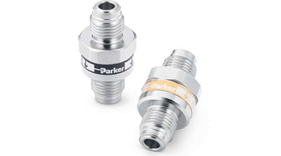 Another highly sought after Parker product is the Hi Check Valve. Delivering an opening pressure of 10 psi max, these durable valves provider two options for cold pressure ratings: Class 2500 and Class 4500. This means that the potential for leakage is drastically reduced. Furthermore, the ability to add pressure ends means that taper threads and thread sealants are less likely to be required. Offering a back-stopped poppet that has been proven to limit stress caused to the inner spring, Parker C Series valves are extremely popular within the oil and gas, pulp and paper, power and utilities, and pharmaceutical sectors. Male and female CPI, NPT, UltraSeal, A-LOK, VacuSeal, Seal-Lok, SAE and BSP connections are available. With a unique seat design that safeguards against blow-outs, it is no surprise that these fluid check valves are bestsellers. For more information about our complete range of Parker check valves, please call 0118 970 2060 or email us at fluid@fluidcontrols.co.uk.